The Amsterdam Dance Event (ADE), the world’s largest club-based festival and conference for electronic music, will take place this year from the 19th to 23rd of October. The organisers are expecting around 375,000 national and international visitors for the 21st edition. Over the last 20 years ADE, an initiative of Buma, has become the leading platform for the international dance scene. It is the place 'par excellence' to identify the latest business practices and the freshest musical trends, ranging from emerging talents through to the most recent work of electronic music's pioneers and superstars. The event continues to grow and develop each year, with last year’s anniversary edition featuring 2289 artists performing in 100 venues and more than 500 speakers taking part in the nine different conference streams. The extensive film, art, and audiovisual program has also been expanding each year, and the organisers are committed to growing the day and nighttime activities once again in 2016. “ADE has developed into a platform where every aspect of the global phenomenon that is dance music culture comes together. It is fantastic to see that Amsterdam has become a global destination for both music lovers and the music industry,” says ADE Director Richard Zijlma. The Amsterdam Dance Event takes place from the 19th to 23rd of October, 2016. The Amsterdam Dance Event (ADE), the world’s largest club-based festival and conference for electronic music, will take place this year from the 19th to 23rd of October. The organisers are expecting around 375,000 national and international visitors for the 21st edition. The first wave of festival acts is revealed today, along with further keynote speakers for ADE Conference. ADE's multiple conference streams connect the worldwide music industry, offering the ultimate annual business and inspiration platform in the field of electronic music. Divided into nine themed programs, ADE's comprehensive conference covers every aspect of the modern music industry, featuring dedicated programming for business professionals, start-ups, aspiring producers and musicians, students, VJs, visual artists and stage designers. The programs also feature in-depth expertise and insight into the harder and urban music genres, the connection between dance & brands, the relationship between music and technology, and sustainable, ecologically responsible practices for the global dance music industry. Keynote speakers confirmed for 2016 include Kickstarter’s head of music Molly Neuman, Def Jam CEO Steve Bartel and COO of Red Light Management Bruce Eskowitz. Mute founder Daniel Miller will keynote on the importance of spontaneity in music and CEO of artist management firm Emagen Entertainment Group Anthony Saleh will keynote Q&A on 21st century management. Plus, ADE is honoured to welcome another true innovator of the global independent scene, Martin Goldschmidt, Managing Director of the global indie label Cooking Vinyl. Grammy Award winner Om’mas Keith, TommyD, and Luca Pretolesi also join the 2016 speaker line-up. The trio of legendary producers will be talking 21st century studio life and timeless technique. With over 400 speakers to be announced this is set to be the biggest edition to date. In the past twenty years ADE has grown into a globally renowned platform for the international dance and electronic music scene. The festival is the perfect place to spot the latest musical trends and emerging talents, as well as hearing the most recent work of both electronic music pioneers and current superstar acts. In addition to the extensive line-up of the ADE Festival, the ADE Playground offers music enthusiasts a large and varied daytime program including exhibitions, in-store promotions, pop-up stores and film screenings all over the city center. The business aspect of the event (ADE Conference) is recognized as the most important of its kind, presenting a broad range of conferences and networking opportunities that focus on music and technology, VJs & visuals, sustainability, dance & brands, harder dance styles, new talent and the education of students. ADE 2016 announces second wave of festival acts and the launch of ADE SLEEP/OVER, a new campsite at NDSM wharf. The Amsterdam Dance Event (ADE), the world’s largest club-based festival and conference for electronic music, will take place this year from the 19th to 23rd of October. The organisers are expecting around 375,000 national and international visitors for the 21st edition. The second wave of festival acts is revealed today, along with the launch of ADE SLEEP/OVER - a new campsite at the NDSM Wharf which features a range of free special talks and performances for festivalgoers. Adam Beyer (SE), Axwell Λ Ingrosso (SE), Blind Observatory (DE), Craig David (GB), Dave Clarke (GB), Dixon (DE), DVS1 (US), Hardwell (NL), Jackmaster (GB), Joris Voorn (NL), Kölsch (DK), Levon Vincent (US), Martin Garrix (NL), Maya Jane Coles (GB), Nicole Moudaber (GB), Octave One (US), Palms Trax (DE), Rebekah (GB), Recondite (DE), Richie Hawtin (CA), Seth Troxler (US), Shanti Celeste (CL), Sven Väth (DE), Tale of Us (IT), The Martinez Brothers (US), and Tiësto (NL). This year ADE introduces ADE SLEEP/OVER, a pop-up campsite located on the impressive post-industrial site of the NDSM Shipyard, only 15 minutes away from the city’s Central Station. A brand new addition to complement the 24/7 ADE experience, the spacious campsite offers over four hundred comfortable, heated, sleeping accommodations with jaw-dropping views over the city of Amsterdam. Besides a unique stay and meeting point, ADE SLEEP/OVER, an initiative by Amsterdam Dance Event, Wink and the NDSM Foundation in collaboration with Camping De Lievelinge and CampSolutions, is also the place to experience a taster of what the wider ADE program has to offer. ADE SLEEP/OVER and the industrial backdrop of the NDSM Shipyard will play host to it’s very own program, including music events, artist talks and contemporary art installations. More information about the full ADE SLEEP/OVERprogram to be announced. Scottish electronic music pioneer Hudson Mohawke, groundbreaking L.A. collective Soulection, Grammy Award winner Om’mas Keith, Dutch MC’s Sevn Alias and Hef and many more are among the first speakers announced for this years ADE Beats, ADE’s annual platform for hip-hop, bass and beats, which returns to the Melkweg. Plus, Raphael Aflalo, CEO and co-founder of My Love Affair, will share his insights on Thursday October 20th, during ADE Dance & Brands, the sub-conference dedicated to connecting brands with the electronic music scene. They join previously announced speakers including: Steve Bartels (CEO Def Jam, US), top producers Tommy D (GB) and Luca Pretolesi (IT), Dan Miller (Mute Records, GB), Bruce Eskowitz (COO Red Light Management, US) and Molly Neuman (Head of Music Kickstarter, US). The Amsterdam Dance Event (ADE), the world’s largest club-based festival and conference for electronic music, will take place this year from the 19th to 23rd of October. 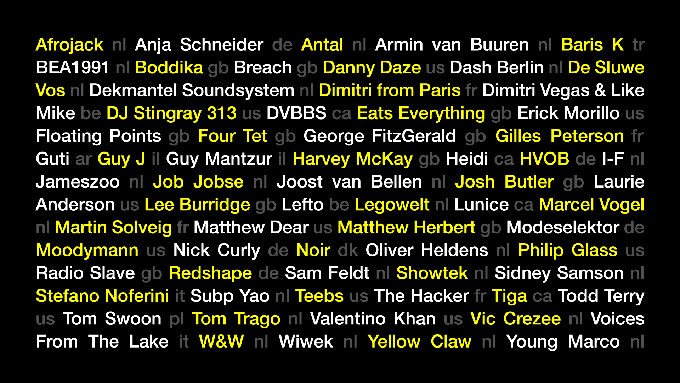 The ADE Festival will feature 300 events and over 2000 DJ’s from the whole spectrum of electronic sub-genres, across 5 days in 100 different clubs and venues, making Amsterdam one of the busiest and most inspiring clubbing cities in the world. With the latest addition of Carl Craig (US), David Guetta (FR), DJ Harvey (GB), Gui Boratto (BR), Hudson Mohawke (GB), Jazzy Jeff (US), John Talabot (ES), Netsky (BE), Sander van Doorn (NL) and Sasha (GB), the 2016 festival line up of the Amsterdam Dance Event (ADE), an initiative of Buma, is almost complete. Adam Beyer (SE), Axwell Λ Ingrosso (SE), Craig David (GB), Daniel Avery (GB), Dave Clarke (GB), Derrick May (US), Dixon (DE), DVS1 (US), Ellen Allien (DE), Etapp Kyle (UA), Fedde Le Grand (NL), Hardwell (NL), Jackmaster (GB), Jamie Jones (GB), Jeff Mills (US), Jessy Lanza (GB), Joris Voorn (NL), Karenn (GB), KiNK (BG), Kölsch (DK), Laurent Garnier (FR), Levon Vincent (US), Loco Dice (DE), Louisahhh (US), Martin Garrix (NL), Maceo Plex (US), Maya Jane Coles (GB), Monika Kruse (DE), Nicole Moudaber (GB), Octave One (US), Palms Trax (DE), Ricardo Villalobos (CL), Rebekah (GB), Recondite (DE), Richie Hawtin (CA), Roman Flügel (DE), RÜFÜS (AU), Sandrien (NL), Secret Cinema (NL), Skepta (GB), Seth Troxler (US), SUUNS (CA), Sven Väth (DE), Tale of Us (IT) and Tiësto (NL). DJ and record label owner Gilles Peterson (FR), hip-hop pioneer Kurtis Blow (US), DJ and producer Laidback Luke (NL), electronic artist and technology adventurer Richie Hawtin (CA), multi-platinum producer Scott Storch (US) and producer Sevn Alias (NL) are amongst the latest additions to ADE’s conference line-up. They join previously announced speakers including Bruce Eskowitz (COO Red Light Management, US), Hudson Mohawke (Warp Records, TNGHT, GB), Molly Neuman (Head of Music Kickstarter, US), Raphael Aflalo (CEO and co-founder of My Love Affair, FR ) and Steve Bartels (CEO Def Jam, US). 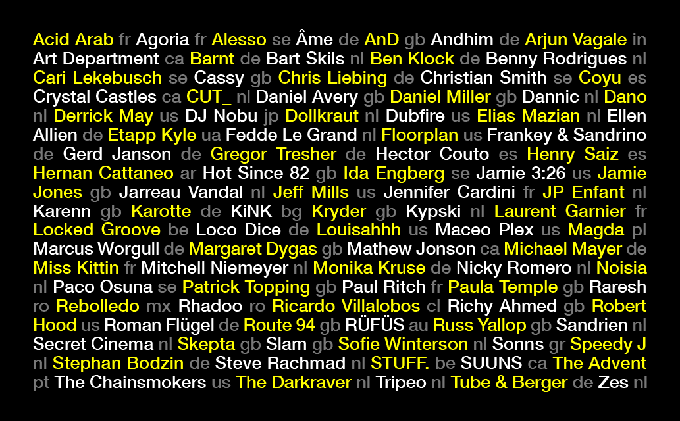 ADE’s multiple conference streams will play host to an expected 450 speakers. ADE, DGTL and Young Creators present the first global hackathon for the dance scene. To stimulate innovation and entrepreneurship in the dance and festival scene, ADE 2016 will see DGTL, Young Creators and ADE joining forces to organize the first ever ADE Hackathon. As the electronic music scene is using data & technology more and more, the three parties acknowledge that it is of importance to discover further opportunities in this domain. At the ADE Hackathon, smart developers, designers and entrepreneurs are asked to think about the challenges that are faced by the dance and festival scene, but also to think about the opportunities that data and technology provide. A group of 100 selected bright minds will be invited to develop smart concepts, new apps and inspiration within a challenging timespan of 24 hours. Example topics include: Enhanced Festival Experience, Safety & Security, Dance & Travel and Festival Logistics. More program information will be announced soon. The full programme for ADE 2016 is unveiled today! 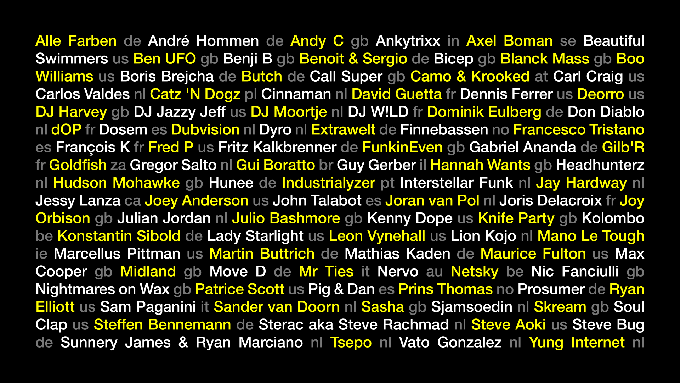 The Amsterdam Dance Event (ADE) announces the complete program for the upcoming edition, which will take place from October 19th – 23rd 2016. With well over 2.200 artists, 450 conference speakers and a record breaking 140 participating venues, Amsterdam Dance Event is the world’s biggest dance music club festival and leading business platform for the electronic music industry. For the 2016 edition, the 21st since ADE’s inception in 1996, the organization expects to welcome the record number of 375.000 visitors. ADE’s renowned festival makes Amsterdam one of the busiest and most inspiring clubbing cities in the world. This year's program covering the whole spectrum of electronic sub-genres, with more than 2.200 artists performing in 140 of Amsterdam's finest music and nightlife spaces, including major venues like Melkweg, Paradiso, Westergasfabriek, the Concertgebouw, Heineken Music Hall, Ziggodome and NDSM Wharf, and the city's newest hotspots Claire, De School and Shelter. New acts joining the line-up today include Afrojack, Anja Schneider, Antal, Armin van Buuren, Boddika, Breach, Danny Daze, Dimitri from Paris, DJ Stingray 313, Eats Everything, Erick Morillo, Floating Points, Four Tet, Heidi, HVOB, I-F, Job Jobse, Legowelt, Martin Solveig, Matthew Dear, Modeselektor, Moodymann, Oliver Heldens, Philip Glass, The Hacker, Todd Terry, Tom Trago ,Voices From The Lake, and Yellow Claw and Young Marco. Adam Beyer (SE), Afrojack (NL), Anja Schneider (DE), Antal (NL), Armin van Buuren (NL), Axwell Λ Ingrosso (SE), Baris K (TR), Beautiful Swimmers (US), Ben UFO (GB), Benji B (GB), Boddika (GB), Breach (GB), Carl Craig (US), Craig David (GB), Danny Daze (US), Dash Berlin (NL), David Guetta (FR), Dave Clarke (GB), De Sluwe Vos (NL), Dekmantel Soundsystem (NL), DJ Harvey (GB), Dimitri from Paris (FR), Dimitri Vegas & Like Mike (BE), Dixon (DE), DJ Stingray 313 (US), DVBBS (CA), Eats Everything (GB), Ellen Allien (DE), Floating Points (GB), Four Tet (GB), Francesco Tristano (ES), George FitzGerald (GB), Gilles Peterson (GB), Goldfish (ZA), Guti (AR), Guy J (IL), Hardwell (NL), Heidi (CA), HVOB (DE), Hunee (DE), I-F (NL), Jackmaster (GB), Jeff Mills (US), Job Jobse (NL), Joost van Bellen (NL), Joris Voorn (NL), Kölsch (DK), Laurie Anderson (US), Legowelt (NL), Lunice (CA), Martin Garrix (NL), Martin Solveig (FR), Matthew Dear (US), Matthew Herbert (GB), Maya Jane Coles (GB), Modeselektor (DE), Moodymann (US), Monika Kruse (DE), Nicole Moudaber (GB), Octave One (US), Palms Trax (DE), Philip Glass (US), Radio Slave (GB), Rebekah (GB), Redshape (DE), Richie Hawtin (CA), Sam Feldt (NL), Seth Troxler (US), Showtek (NL), Sidney Samson (NL), Skepta (GB), Stefano Noferini (IT), Sven Väth (DE), Subp Yao (NL), Tale of Us (IT), Teebs (US), The Hacker (FR), Tiësto (NL), Tiga (CA), Todd Terry (US), Tom Swoon (PL), Tom Trago (NL), Valentino Khan (US), Vic Crezee (NL), Voices From The Lake (IT), W&W (NL), Wiwek (NL), Yellow Claw (NL) and Young Marco (NL).